• 1967 – 2007 - Quo vadis Israel ? • An Accessory or Just a Friend? In journalism it is pretty rare for fact to be stranger than fiction, and when it happens, you think you might be dreaming. That is what happened to me at a private dinner in Baku, where I met Yevda Abramov. This pleasant, smiling man, bubbling with intelligence, is a member of the Azerbaijan Parliament in a secular, Shiite Muslim country! Yevda Abramov is a Cohen, of priestly stock, from a Jewish family from Iraq, the son of a former leader and spiritual guide of the Jewish community of Azerbaijan. He handles with ease and aplomb his double identity as Jew and Azeri. The history of his family in Azerbaijan, in the village of Shemakha, some 250 km north-west of Baku, goes back 750 years. In 1902, following a dreadful earthquake that destroyed the town, most of the Jewish survivors left for Guba, where his family still lives. Until 1936 Jewish education was fairly free, despite communist rule. But in 1937 teaching the Jewish religion was prohibited, and it could only be practiced in hiding, at home. During the Second World War, Yevda Abramov’s father was called up to serve in the Red Army to fight the Nazis. Yevda Abramov is proud of his two affiliations, both national and religious. He has excellent relations with the President of the country, while at the same time he goes often to Israel, where three of his four children live. One of his sons, incidentally, is career officer in the IDF. Yevda was born in 1948 and studied education and international relations. He started his career as a teacher, before becoming principal of the school and then mayor of the village of Krasnaya Sloboda and chairman of the Guba regional council. 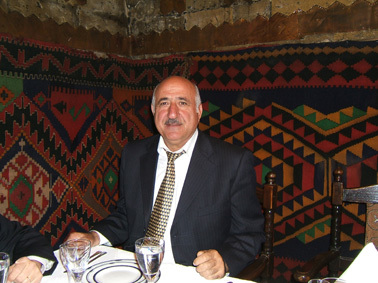 He was involved in regional politics from 1986 to 1999 prior to joining the President’s party, and in 2005 he was elected to the Azeri Parliament. As a Jew, how are you seen by your parliamentary colleagues, most of whom are Muslims? My relations with my colleagues are excellent, both personally and professionally. As in every democracy, in politics we are far from agreeing on everything and each one defends his own point of view, but the fact that I am Jewish is really not relevant. This is well illustrated by a little story. Recently a member of the Guba Jewish community asked various questions to the Speaker of the Parliament, who jokingly replied, “Go ask Yevda, I think he knows more than I do, he is more popular and has a great deal of parliamentary support”. All my colleagues know I have children in Israel, and I have also started several shared projects between the Azeri Parliament and the Knesset, particularly in the field of women’s rights. Why did you choose to go into politics? When the late President Heydar Aliyev came to power in 1993 the Jewish community decided to support him and to help him stay in power. We were aware that an Islamic revolution could not be excluded, and clearly we did not want one. There was a risk that the country would fall into the hands of incompetents. In a speech to the nation, the President said in particular, “I want to create a nation where everyone enjoys the same rights. Give me a bit of time and you well see the benefits of my policies”. I decided to give him my support for the sake of Azerbaijan and of our community, which risked finding itself in danger again. So I first represented his party in the Guba region, and one thing followed another and I started a career in politics. How would you assess relations between Azerbaijan and Israel? They are deep-rooted and well developed in several fields. I regret that there is still no Azeri ambassador appointed to Israel, but I hope that is just a matter of time. It should be understood that one of the reasons for Azerbaijan’s stability is our President’s ability to maintain excellent relations with our neighbors, Iran and Russia, while working for the good of the country. It is not something simple, because these two countries support Armenia in the disputed issue of Nagorno-Karabagh. I recall in 1993 we lost 16% of Azeri territory in a war with Armenia and we had to absorb 750,000 Azeris who fled the region. Relations with Israel offer a certain number of advantages from which we benefit, particularly in technology. In this connection it is interesting to note that the only Israeli Prime Minister to have come here was Benjamin Netanyahu, who when he came into office understood the importance of our oil reserves. Azerbaijan is a member of the Organization of the Islamic Conference. As such your country has a certain number of group responsibilities. How does that tie in with the good relations you have with Israel? We have excellent relations with Saudi Arabia and we do indeed have a certain number of group responsibilities on account of our membership of the organization you mentioned. But that is all strictly economic, and is in no way political. What’s more, we are very easy, given that most Arab states support Armenia and invest nothing or very little in Azerbaijan, which greatly strengthens our political freedom of maneuver. Incidentally, there are only two Muslim states that support us against Armenia, Pakistan and the United Arab Emirates. Moreover, you should be aware that Azerbaijan’s economic and political independence is based on the quantity of its oil and natural gas resources. However, we are very much aware of the traps that can be caused by an abundance of natural riches. We know very well that growth does not compare to financial resources, and that we can be trapped by the well-known “Dutch disease”, namely financial prosperity that is not based on work leads to false social peace, stagnation in real growth and general corruption in the distribution of income, with an undue concentration of national revenues in the hands of a small number of speculators. This inevitably leads to the pauperization of a large part of the population and increases the risks of political instability, especially by strengthening possible Islamic fundamentalist movements that are encouraged and financed by certain of our neighbors. However, I believe that such an eventuality is entirely excluded since for the time being we do not even see the first signs. We keep our feet planted firmly on the ground, and the values of work, a high level of education and incorruptibility are national priorities. They go hand in hand with working the oil and gas and with all the advantages of that windfall, which ensure our stability and independence. This is a balancing act that is not easy to achieve and even more so to maintain, since the outlook for the future is staggering, with one recent forecast stating that by 2030 oil revenues could reach US $ 160 billion (on a base price of $45 per barrel), whereas in 2005 our entire national budget came to $2 billion. How do you see the future of the Azerbaijan Jewish community? You certainly reckon that as a politician I am just telling you stories, but the fact is that overall the Jews live above the average of the Azeri population. And even though this is a Shiite Muslim country, we are first and foremost a democracy in which religious freedom is totally guaranteed. However, we are a young democracy that has just emerged from under the Soviet yoke and we are still suffering from the usual childhood illnesses. The country’s general situation, in particular the shortage of work, the low standard of living, housing shortages in the main towns and more, also affect the Jewish community. Many have gone to live in Russia, in Europe, in America and in Israel. I believe this is a temporary situation that will get better with time and that will allow those who have left to come back. The future of the Jewish community is directly linked to this development. That’s why I have reason to consider the future with both optimism and realism.